Relax and unwind with this works' Dream Team Deep Sleep Duo. Combining two aromatherapeutic solutions for a good night's sleep, the pillow spray and fragrant roller ball work in tandem to inspire feelings of calm and prepare you for a deep and restful slumber. Designed to inspire a relaxing and rejuvenating deep sleep, this pillow spray is sure to become your must have sleep solution. Formulated with natural oils, the fragrant formula releases relaxing vibes so you inhale calm and exhale your worries. Containing Lavender, Vetivert and Wild Chamomile oils, this pillow spray is perfect for winding down. Created to help you breathe easily whilst calming your senses, the roller ball inspires a fully relaxed and rejuvenated night's sleep. Formulated with a natural remedy that helps to calm the senses and counteract physical and mental fatigue, the multi-purpose, aromatherapy blend can be used any time to promote restful sleep. Containing refreshing Eucalyptus, Frankincense and Lavender Essential Oils to fight infections and ease hypertension, nervous tension and insomnia, this works for those wanting to clear their head and improve sleep quality. Also rejuvenates the skin. Pillow Spray: Spray a fine mist directly onto your pillow (approximately 30 centimeters distance away). Once this has been done, lay back and breathe in through your nose and mouth to aid you to sleep. 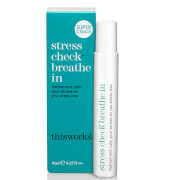 Stress Less: Apply to wrists or tissue and inhale the vapours. Pillow Spray: Aqua, Polysorbate 20, Parfum, Lavandula Angustifolia (Lavender) Oil, Pogostemon Cablin (Patchouli) Oil, Cinnamomum Camphora (Ho Wood) Oil, Vetiveria Zizanoides (Vetivert) Oil, Ormenis Multicaulis (Wild Chamomile) Flower, Extract, Linalool, Diazolidinyl Urea, Geraniol ,Limonene, Iodopropynyl Butylcarbamate. Stress Less: Cocos nucifera (Coconut) oil, Eucalyptus globule (Eucalyptus) oil, Boswellia carterii (Frankincense) oil, Lavandula angustifolia (Lavender) oil, Lavandula hybrida grosso (Lavandin) oil, Ravensara aromatica, (Ravensara) oil, Melaleuca leucadendron (Cajuput) oil, Melaleuca viridiflora (Niaouli) oil, Limonene, Linalool.